One man emerged from a coma on Friday six days after being hit in the head. 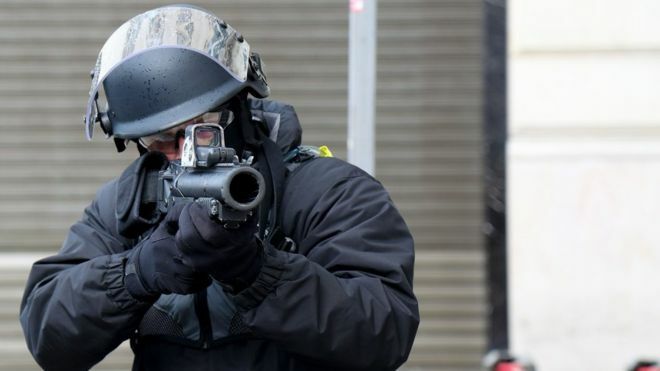 France’s human rights chief has called for the weapon’s use to be halted, but the government insists it is deployed only under very strict conditions. Since the “gilets-jaunes” protests began in November, 3,000 people have been injured or even maimed and thousands more arrested. Peaceful rallies have sometimes ended in violence and vandalism and 1,000 police are among those wounded. Ten deaths have been linked to the unrest. Nine involved traffic accidents and an 80-year-old woman died after being hit in the face by a tear gas grenade while closing the shutters at her home. The LBD40 is described as a non-lethal weapon which in fact replaced the old “flash-ball” in France. But the old name is still widely used. It shoots 40mm (1.6in) rubber or foam pellets at a speed of up to 100m per second and is not meant to break the skin. However, some of the accounts of people hit by flash-balls have been shocking. Many of those wounded have been young. One teenager called Lilian Lepage was hit in the face in Strasbourg on Saturday and suffered a broken jaw. His mother said he had been shopping in the city centre when a policeman fired at him. Two schoolboys were badly wounded by flash-ball pellets in separate protests last month. Campaigners say a dozen people have lost an eye, although the details have not been corroborated. A lawyer for some of the victims, Étienne Noël, said many had been maimed. He said police did not have sufficient training in use of the riot guns and many victims had been hit in the head. Earlier this week police made clear the riot gun would be used only where security forces faced violence or if they had no other means of defence. Only the torso and upper or lower limbs could be targeted. Interior Minister Laurent Nuñez told the French Senate on Thursday that the use of force by police was always proportionate and under very strict and controlled conditions. “If the police hadn’t used these means of defence perhaps some of them would have been lynched,” he said. The European Court of Human Rights rejected a temporary ban on flash-balls last month, in a case brought by several people who said they had been hit by flash-balls.